Lambert here: “Close to 40% of multinational profits were artificially shifted to tax havens in 2015.” Holy moly! A live demonstration of the accuracy of a Hellfire or Harpoon in downtown Zurich will bring tax avoidance to a very quick end. Once Steve Bannon selects a tax law firm, it’s just a matter of time…. Maybe we should invade all those tax havens. I’ll bet we’ll recover our military expenditures very quickly. Yes! Let’s bring democracy to those countries! Ooh boy, I needed that laugh, Thanks! Why not just eliminate corporate income taxes entirely? Instead tax both the wealth and income of the beneficial owners of corporations, the stock and bond holders. Personhood has consequences. Gotta pay the piper for all that free speech and limited liability. I recommend simplifying tax codes and progressively increasing rates to give corporations an incentive to spend. I would penalize more than nominal stock buy backs, excessive exec. comp and so on, and other egregiously anti-social conduct. Related to that is to limit limited liability and make more things undischargeable in bankrcuptcy than just student loans. It would also make sense to more vigorously use control provisions. For example, a corporation should be deemed headquartered and subject to tax and other jurisidictional claims based on where its principal officers work and make decisions, not in the most convenient secrecy jurisdiction chosen by their tax accountants. Ditto with earnings and taxes, particularly given how much “trade” is intracompany. The point is to use taxes for what they are designed to do – encourage some behavior, discourage others – rather than simply to reward lobbying prowess. This phenomenon represents a lack of political will more than anything else IMO. Funds transfers are traceable and can be reconciled with accounting entries by tax auditors. However, with all the gaming of intra-company transfer costs that is going on to minimize reported taxable income in higher tax jurisdictions, why not just tax corporate gross revenues in each country rather than their reported taxable profits? The individuals who own and manage these transnational banks and corporations want all the benefits associated with operating in developed countries without participating in paying for them. Yes, if we can enforce sanctions on foreign countries for their economic activity abroad, we can certainly enforce the tax code on domestic industry and finance. As usual, Canada is chopped liver? However, the graph explains a lot about what happened to Puerto Rico. IMHO, SW, LX, IR, and those other guys on the left side of the chart should look out. Can’t go on like this. Boycotting needs to make a comeback. I see no other reason how corporations will comply. Wow – very interesting. We’re now starting to quantify the scale of the corporate tax avoidance problem. My guess is a good portion of these missing profits are related to intellectual property. 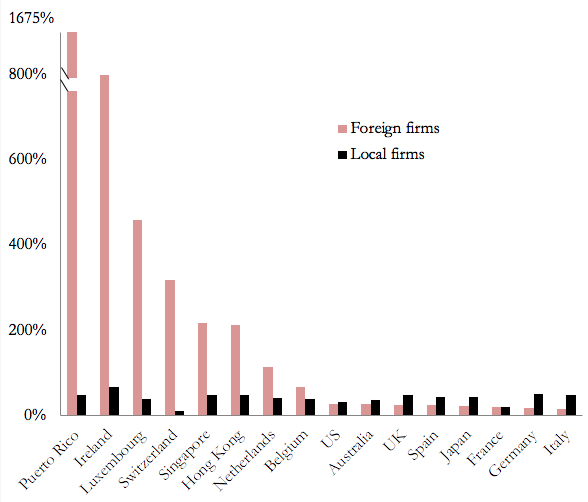 Many U.S. companies transfer ownership of their intellectual property to a foreign subsidiary. This foreign subsidiary then collects royalties on every sale of the companies products in compensation for the right to use copyrights, patents, and trademarks associated with these products. I think the local subsidiaries which sell these products can deduct intellectual property royalty payments from their taxable earnings, resulting in even less taxable income reported in the country where a sale originates. Strategies like these shift most of the taxable income from a companies worldwide product sales to their foreign intellectual property subsidiary, which resides in a low tax jurisdiction. The recently passed Tax Cuts and Jobs Act included a token minimum tax on certain types of foreign subsidiary income, but we apparently have a long way to go in addressing this issue. I’d say their estimations are low, only 40% shifted? The decline in corporate tax rate is the result of faulty policies in high-tax countries, not a necessary by-product of globalisation. As long as IP is almost impossible to value then tax-avoidance is easy and IP rights are not up to individual countries to decide. International organisations and treaties are keeping the biggest loophole open and they are definitely a by-product of globalisation. TTIP etc…. Let’s call it like it is. This isn’t a matter of policy failures or mistaken policy judgments. This is a matter of corporate criminality aided and abetted by political corruption. The answer lies not in policies but in another “p” word–prisons. They(US multinational) have been extended the carrot with the reduction in corporate tax rates…time for IRS to brandish the stick ( YO Congress …increase their budget!!!). Theoretically, the decrease in the corporate rate should reduce the incentive of US multinationals to move profits offshore…but there’s still a problem…some of the states still have high corporate tax rates ( e.g. PA’s rate is a just hair under 10%). So a PA corp could still have an effective tax blended federal/state rate of about 29%. Probably still too high for them to cease playing games. SO IRS will still have its work cut out for it.